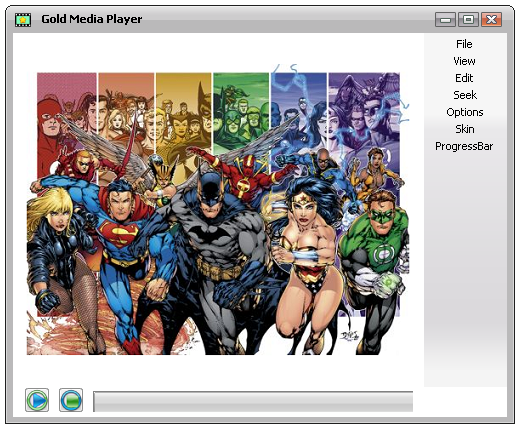 Gold Media Player is a clean and easy-to-use all-in-one player. Gold Media Player supports most popular media files (AVI, 3gp, ASF, FLV, Matroska, MOV QuickTime, MP4, NUT, Ogg, OGM, RealMedia, DivX plus many more). You can watch VideoCD, SVCD, DVD, 3ivx, DivX 3/4/5 and even watch video files while you are downloading them! Intel Pentium II 350MHz or above. 64 MB RAM or above. ...... European/ISO 8859-1,2 (Hungarian, English, Czech, etc), Cyrillic and Korean along with 12 subtitle formats (MicroDVD, SubRip, OGM, SubViewer, Sami, VPlayer, RT, SSA, AQTitle, JACOsub, PJS and our own: MPsub. As well as supporting DVD subtitles (SPU streams, VOBsub and Closed Captions). Audio track switching. Works with avi and mkv. And of course with DVDs. Several filters are available: deinterlace, postprocessing, denoise and even a karaoke filter (voice removal). Audio and subtitles delay adjustment. Advanced options, such as selecting a demuxer or video and audio codecs. Playlist. Allows you to enqueue several files to be played one after each other. Qweas is providing links to Gold Media Player 2.1 as a courtesy, and makes no representations regarding Gold Media Player or any other applications or any information related thereto. Any questions, complaints or claims regarding this application Gold Media Player 2.1 must be directed to the appropriate software vendor. You may click the publisher link of Gold Media Player on the top of this page to get more details about the vendor.